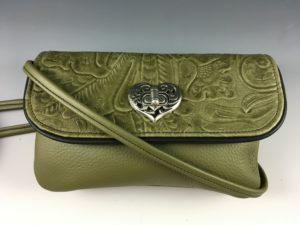 I make every purse myself, one at a time, here the the USA. Possible variations for all my purses and bags are almost limitless. 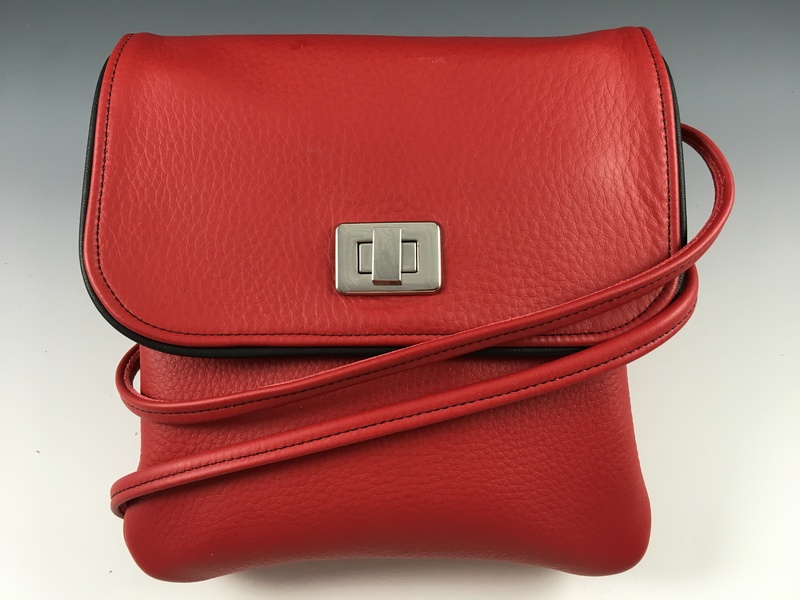 You can select your own customized purse using the primary and secondary color options. The secondary color is used as an accent strip or on the flap on some models. You can find my list of COLORS and CLASPS and TEXTURES under Options on the menu bar. Or enjoy my Gallery of photos, showing dozens of purses and bags I’ve made recently. All zippers are YKK® brand, and will be silver in color. If you would prefer brass zippers, just let me know in the comments section on Etsy. A small slim cross-body bag, sized just right for a checkbook, sunglasses or the largest cell phone. 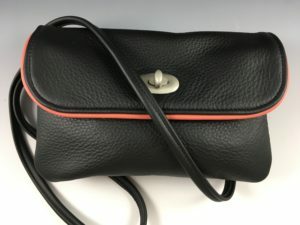 It has one outside zip pocket and one open pocket and has a drop length of 25″. Fashioned from imported Italian cowhide for its brilliant color and durability, it measures 6″ x 8″ x 1″. All zippers are YKK® brand, and will be silver in color. If you would prefer brass zippers, just let me know in the comments section on Etsy. You can order your own customized purse using primary and secondary color options in my Etsy shop. Shipping is free! A petite hobo bag with a wide shoulder strap. It has one outside and one inside pocket. Drop length is 14″. Measures 10″ x 7″ x 4″. Fashioned from imported Italian cowhide. All zippers are YKK® brand, and will be silver in color. If you would prefer brass zippers, just let me know in the comments section on Etsy. 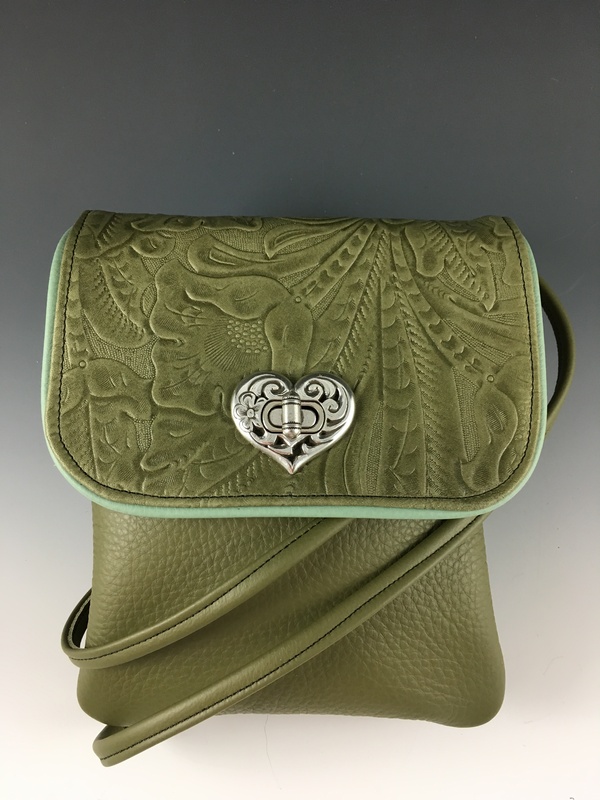 You can order your own customized purse using primary, secondary, and trim color options in my Etsy shop. Shipping is free! 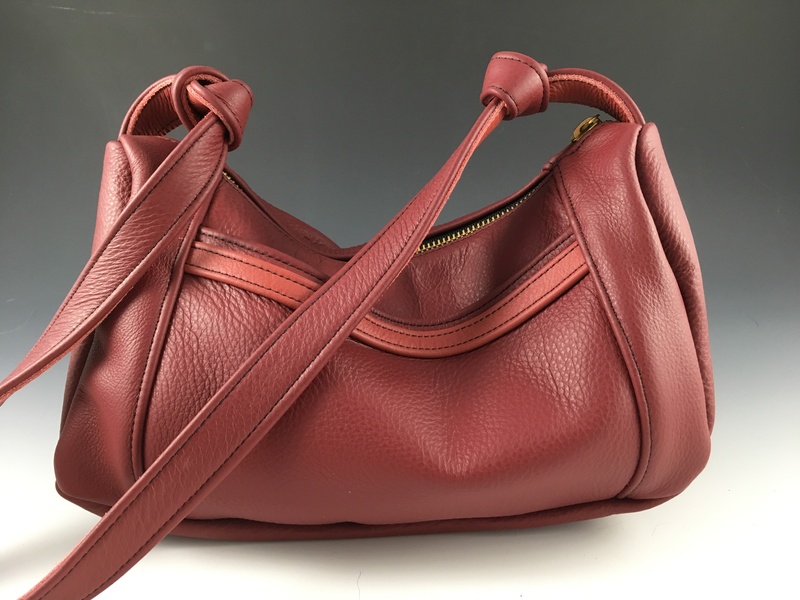 The same hobo bag, but with a long, slender strap that can be worn cross-body. It has one outside and one inside pocket. Drop length is 25″. Measures 10″ x 7″ x 4″. All zippers are YKK® brand, and will be silver in color. If you would prefer brass zippers, just let me know in the comments section on Etsy. 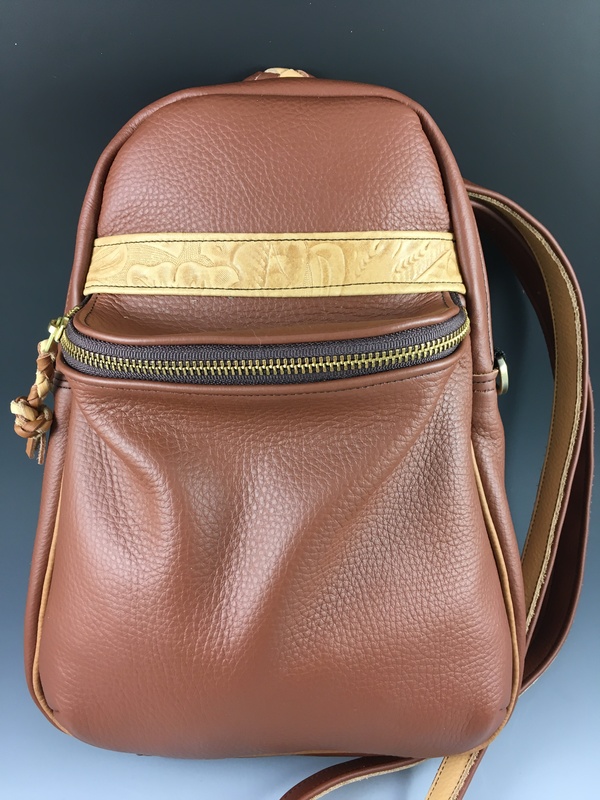 This small backpack easily converts to a cross-body bag, with zippered top and front compartments, and a small back compartment that conceals your valuables when worn as a backpack. Locker loop for hanging. It has a smart phone pocket and key fob inside the main compartment. It’s drop length is 25″ when used as cross-body bag. All zippers are YKK® brand, and will be silver in color. If you would prefer brass zippers, just let me know in the comments section on Etsy. Fashioned from imported Italian cowhide for its brilliant color and durability, it measures 10″ x 13″ x 4″. You can order your own customized bag using primary and secondary color and texture options. 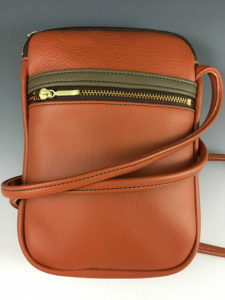 The secondary color is used to trim the front and strap. This handy little bag measures 5″ x 8″ x 2.5″ and has a drop length of length of 25″. It has three inside compartments and a zipper pocket on the back. Your choice of decorative clasps. Fits small cell phones. All zippers are YKK® brand, and will be silver in color. If you would prefer brass zippers, just let me know in the comments section on Etsy. 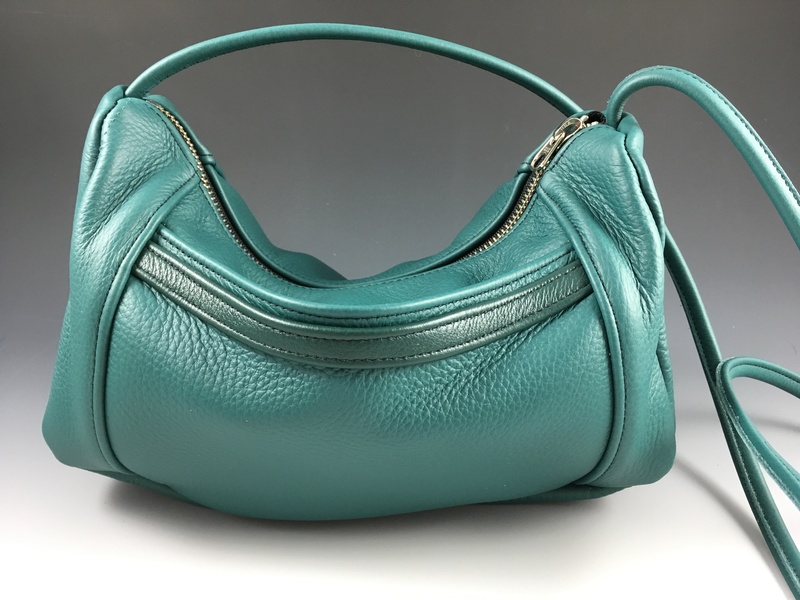 This bag is identical to 3H but is sized for larger cell phones. It measures 6″ x 9″ x 2″. All zippers are YKK® brand, and will be silver in color. If you would prefer brass zippers, just let me know in the comments section on Etsy. This bag measures 6″ x 8″ x 2″ and has a drop length of length of 25″. It has three inside compartments, a pocket under the flap, and two zipper pockets on the back. Your choice of decorative clasps. Fits most cell phones. All zippers are YKK® brand, and will be silver in color. If you would prefer brass zippers, just let me know in the comments section on Etsy. This large square bag measures 8″ x 8″ x 3″ and has a drop length of length of 25″. It has three inside compartments, a pocket under the flap, and a zipper pocket on the back. Your choice of decorative clasps. All zippers are YKK® brand, and will be silver in color. If you would prefer brass zippers, just let me know in the comments section on Etsy.